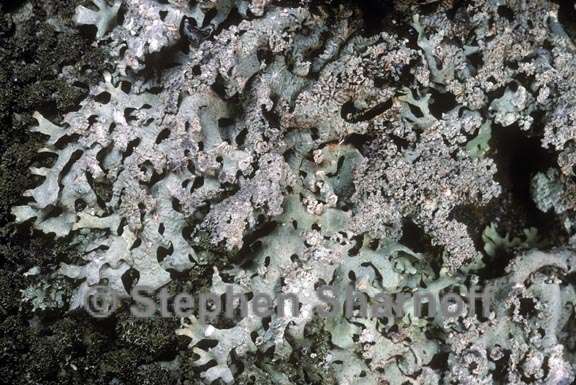 Thallus: foliose, 2-8 cm in diam., adnate, subdichotomously lobate lobes: sublinear, elongate, plane to subconvex, separate, 1-3.5 mm wide; margin: entire; apices: subtruncate upper surface: whitish gray, smooth to rugulose, shiny; pruina and maculae absent soredia: granular, not confluent, in laminal, crateriform pustulae; isidia and dactyls absent medulla: white or yellowish ochre with continuous algal layer lower surface: black centrally, brown peripherally; rhizines: sparse, black, dichotomous Apothecia: rare, laminal, sessile, 1-6 mm diam. ; disc: brown; margin: smooth, epruinose and without soredia ascospores: not found Pycnidia: not seen Spot tests: upper cortex K+ yellow, C-, KC-, P+ yellow, UV-; medulla K- or + purple, C-, KC-, P+ red Secondary metabolites: upper cortex with atranorin and chloroatranorin; medulla with protocetraric acid (major), succinprotocetraric acid (trace or accessory) and pigmentosin B (accessory). Substrate and ecology: on pine and hardwood bark in open, but humid oak and pine forests World distribution: throughout the neotropics and in East Africa Sonoran distribution: Sinaloa in the Sierra Madre Occidental, common on pines.